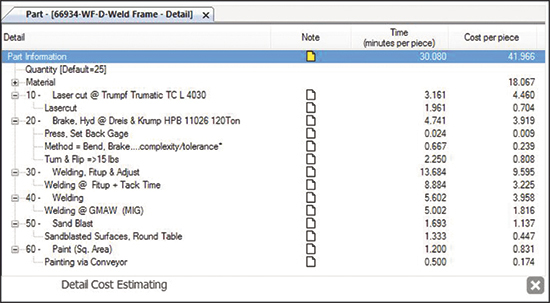 MTI Systems, Inc., West Springfield, MA, has released Costimator version 12 cost-estimating software, packed with upgrades and features that further enhance speed, accuracy and consistency for estimators. Included is a new layer of specialized and unique features for machining and fabrication. • Updated material wizard—Users can account for material drop (scrap), minimum lot charges and surcharges. • New/updated cost models—Painting, routing, cycle time complete, waterjet, laser, shearing, end facing, surface work. • Updated workcenter rates—New manufacturing labor rates have been added/updated to the workcenter database, offering OEMs new options to cost parts made in more than 31 countries and nine U.S. regions.